Here is a view of the vegetable and fruit garden in late Spring 2013. It has been a beautiful Spring with plenty of late, cold days that have kept the Spring greens from bolting too soon. The perimeter of the vegetable garden is lined with peach trees, pear trees, and pineapple guava bushes. Here is a closer look at one of the peach trees that is in its fourth year in the ground. It's trunk is probably four inches in diameter, and it is about 14 feet in height. It has been a very productive tree. 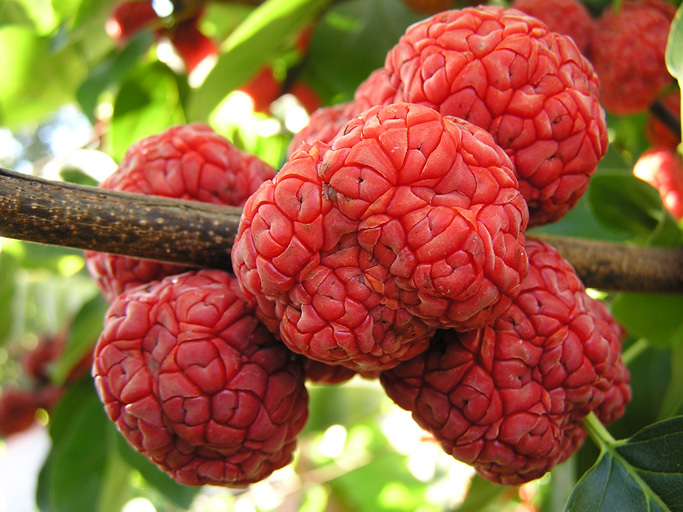 In the photograph above, you can see several of the young immature fruit. In the vegetable garden, we have five peach trees. Several of our pineapple guava bushes are in their fourth year and are really filling out. This bush here is approximately five feet in height. Last year -- their 3rd year in the ground -- was the first year that we had any fruit, but the fruit was not plentiful. This year, the bushes are covered in flowers such as the one above. We should be getting a lot of fruit this year if all of the flowers are successfully pollinated. Here is a photo of the ripened fruit from 2012. Each fully ripened fruit was about the size of a chicken egg. They had a mild and unique taste that seemed to have a combination of mint, pineapple, and strawberry. In the background of this photograph, you can see the Royal Lee and Minnie Royal low chill cherry trees that are less than one year old. These trees are growing like crazy. They did not blossom very much this Spring, and I do not expect any fruit from them. Behind the fence, you can see some plum trees that are approximately four years old. On our way out to Colorado this summer, we stayed at a very nice hotel in Taos called the El Monte Sagrado Hotel. The grounds of this hotel are beautifully landscaped. As an added bonus, the grounds contain an edible landscape of fruiting trees. As you walk on the paths throughout the grounds, you see a lovely landscape of native plants. But as you closely approach the various trees scattered throughout the grounds, you notice that they are all edible fruit trees. There were also a number of pear trees that had not been thinned and were overwhelmed with small pears. In the photo below, you can see a nicely shaped Russian Olive that had small, immature fruit on it. There were several small trees with dainty red, cherry-like berries on them. I am not entirely sure what these were; however, I strongly suspect that they are Juneberries, also known as saskatoons. It was too late in the year for them to be cherries. There were also one or two peach trees that were also filled with fruit. I was impressed with how well taken care of all the trees were. There was no sign of pest or leaf damage on any of the trees. The fruit was also in beautiful condition.